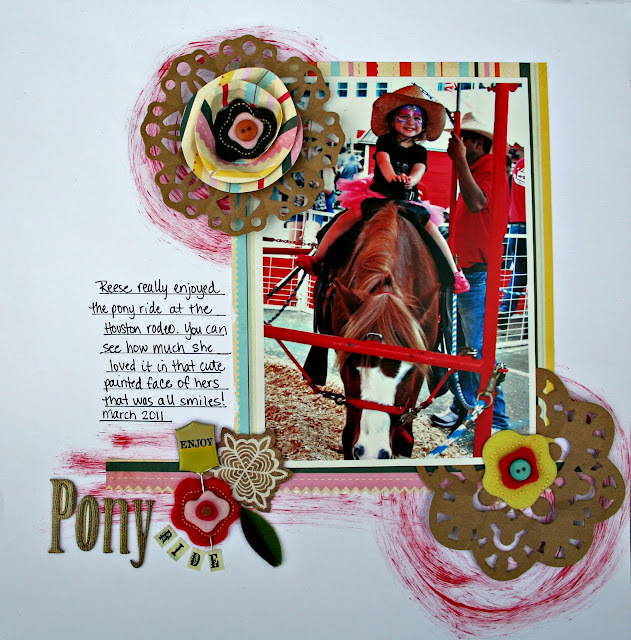 It's a pony ride for Little Miss! 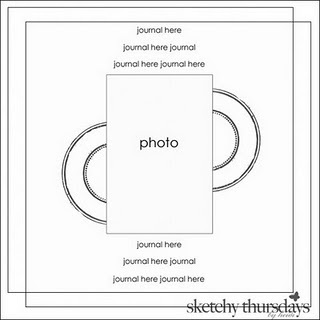 This week's Sketchy Thursdays sketch was fun to play with. I got out this paint dabber that I hadn't used yet so I just went to town making circles to resemble going round and round and round on the pony ride. Pleay along with us this week for your chance to win a Miss Art's Papercrafting School 60-day Extra Credit Subscription, a $30 value!! Today I am featured ont he Imaginisce blog again but this time I teamed up with fellow designer Aphra to show you some Click it with Cricut projects. The theme is April Showers Bring May Flowers. My project is below but make sure to visit the Imaginisce blog to see how I made it and to see the adorable card Aphra made. Oh we are giving away eight 3-month Cricut Circle memberships. Details for winning are below. Man, I wish I could win one! 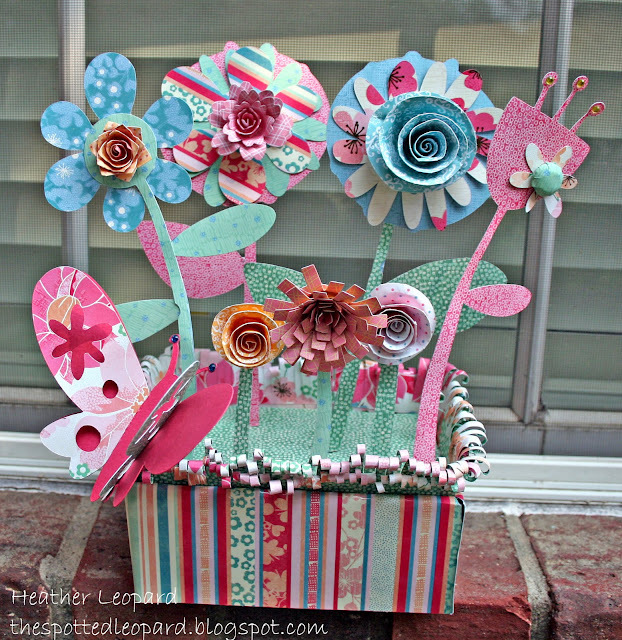 Supplies: Garden Party collection: Darling Dahlias, Blossoms of Blue, Brambleberry Blossoms, Wild Flowers, Rows of Posies; Pink Cardstock; Roly Rosies - Warm flowers and Petal Roller to roll the flowers AND the grass; i-top, small brad daddy; i-bond, i-rock and glam rocks; small box with foam insert; scissors to cut the grass; dowel to glue flowers to so they stand upright and don't flop over. Okay, in order to win a 3 Month Cricut Circle Trial Membership there's just a few things you need to do but it's worth it because the prize is a REALLY great one! 1. Become a follower here at my blog and leave me a comment. 2. Head over to Aphra's blog HERE and tell her how much you loved her project, don't forget to become a follower. 3. Lastly, visit the Imaginisce blog HERE and leave a comment telling us what collection you think we will be releasing next week... hint, it might require you to pitch a tent. Heather These Projects are just WAYYY TOO CUTE! Cheery project. new followers. Got to give it up for IT/scrappers in Houston. Who knew there was more than one? What a cute lay out, and love the window box! Hi , i loved your window box, so cute, and i loved your photo with a tiara too. So fun!! Thanks for share. Love your project! I'm a new follower!! thanks for sharing your window box! So cute and colorful! So pretty! I love all those flowers! this is so adorable! And the butterfly is so cute :) I'm a new follower! So gorgeous!! I am a new follower! Heather the flower box came out just fantastic!!! Super cute LO and I love all the flowers in the flower box! Beautiful blog, I am a new follower! I LOVE my Cricut. Thank you for the opportunity to win this awesome prize! Terrific project! Thank you for sharing. I love that flower box! What a neat flower box, love the colors!! Your flower box is fabulous! This is so very pretty and creative. I love the dimensional projects. Thanks for sharing and the chance to win a circle trial membership! You're so creative! Sadly, my 9yo daughter is no longer interested in pony rides at the Houston rodeo...but now she likes riding the mechanical bull! ;) Such a FUN layout, and WOW on the flower box! 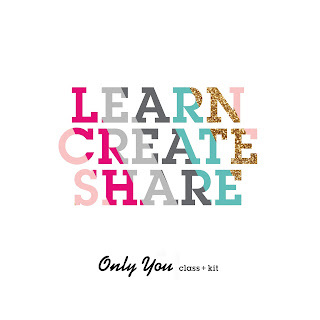 I already follow your blog - thanks for sharing these cute projects today! Heather great flower making. The color tones are so fresh for spring. I think i will follow along as i see lots of inspiration here on your blog. Cute flower box Heather. I will have to give it a try. beautiful! 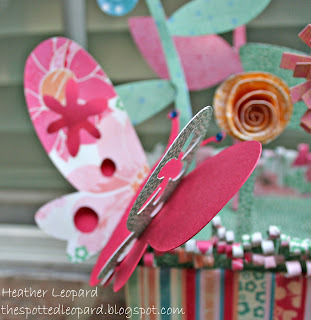 i love the butterfly and the rolled "grass" on the edges. 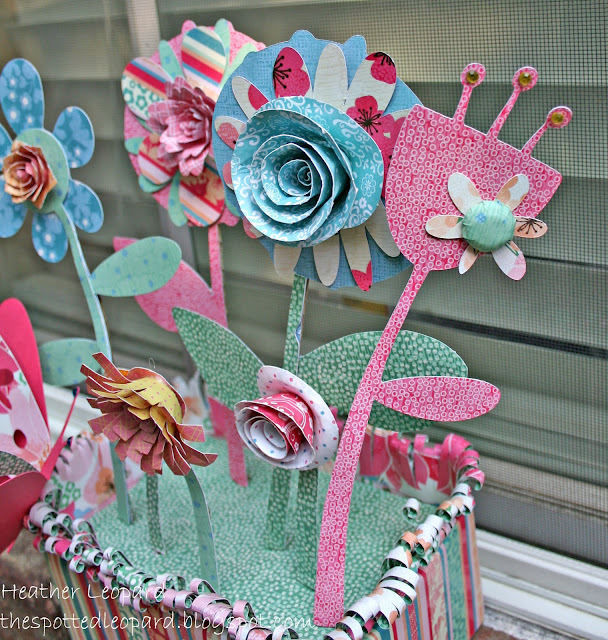 i always forget to use my papercrafting for beautiful decorations, might have to give this one a try! Beautiful flower box! Saw it on Imaginisce. OMYGOSH!!! I need to make this to brighten up my scraproom! I can just never get the hang of those flowers! But this makes me never want to quit trying! Hi heather I'm a new follower and glad I dame across your blog. love what you do with imaginisce products! SO pretty would love this for my daughters room..Thanks for the chance! I follow! really loving your flowers. makes it so springy. i will defiantly have to try this. thanks for sharing. Very cute project! I love how you made several different types of flowers! Just want to let you know I am really new at this.Your flower box is awsome.The colors are all coodinated and it just shows how talented youare.Kepp all the beauty coming I am now a follower of yous and can't wait to see your projects. LOVE LOVE the window box. Beautiful!! I'M a new follower to your blog. I LOVEEEEEEE your flowers. They are so fun! What a cute home decor project. Thanks for sharing. Your flower box is perfect for me! It would last much longer than real flowers at my house! LOL Thank you for such a great project! I am now a follower! Your window box is adorable! I am now a follower! I am a new blog follower and can't wait to see what other ideas you have. The window box is awesome. I love all the colors that you used. Your layout is so nice. There is so many things to look at. I love the picture! Your flower box is adorable. 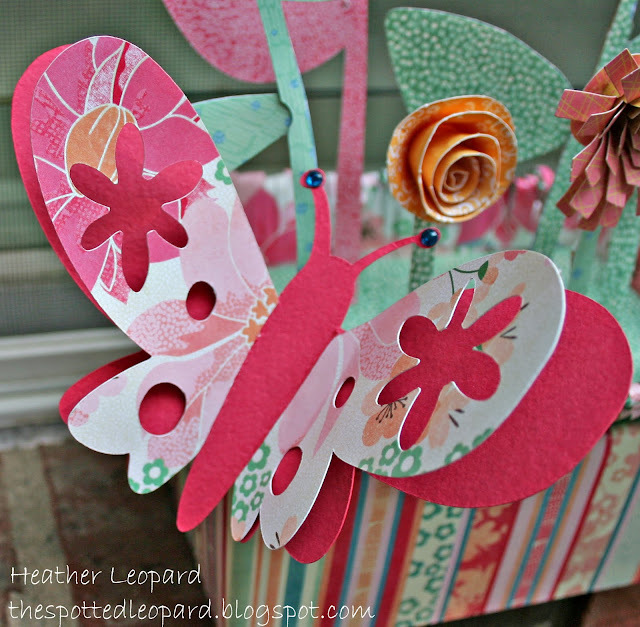 I love all the different types of flowers you created and that big butterfly - too cute! SUPER cute!! I am a total sucker for flowers so this project is perfect for me :) thanks for the chance to win. I am now following your blog!! Love, love, love your work!!!! Love your project! That window box is just too cute! Thanks for the inspiration! So cute! I'm now a follower of your blog and Aphra's too. I'm now a follower and your projects are so cute! I just love that flower box, such pretty colors! :) I'm a follower now! I LOVE your project...sooooo cute!! I'm your newest follower and really hope I win!! :) Thanks for the chance! Love your flower box and butterfly! Imaginisce sent me to necklace follower! I love your take on the flower box! I do not have a green thumb, so these would be PERFECT flowers to grow!! :) Thanks so much for sharing! I adore the flowers!!! The dimension you created by using different flowers and layering them is amazing!!! I love the colors too!!! Oh, the flowers are so cute!!! I am a follower and thanks for the opportunity to try to win. New follower here! That flower box is fabulous! Thanks for all the chances to win. As a circle member I know the value of this AWESOME prize. What an adorable little bouquet! Super cute!! I love how you used the roly flowers! What a cute poject! Gotta love that Cricut!